In the Cartesian system the coordinates are perpendicular to one another with the same unit length on both axes. 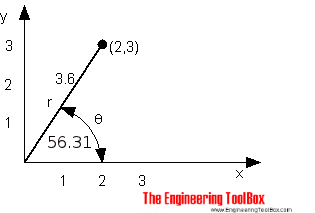 A Polar coordinate system is determined by a fixed point, a origin or pole, and a zero direction or axis. Each point is determined by an angle and a distance relative to the zero axis and the origin. Engineering ToolBox, (2009). Convert between Polar and Cartesian Coordinates. [online] Available at: https://www.engineeringtoolbox.com/converting-cartesian-polar-coordinates-d_1347.html [Accessed Day Mo. Year].